Berlin is full of every kind of store imaginable. They have high-end international designers, covered malls filled with predictable brands, and oodles of independent retailers. Every now and then I have stumbled across stores that strike me as concepts that I hadn’t experienced before. Surely something like them must exist in the US, but I couldn’t tell you what they are. Then again, maybe they don’t. For fun, I present you three such places. “Upcycling” is the word that describes what these creative clothing designers offer. Bis is mir leibe faellt (literally translated: Until it falls off my back) is an alterations store and a one-of-a-kind clothing shop, but it is so much more than that. Repairs turn things into something unique. What we call uniquing is the heightening of this effect, and may even involve designing a completely new garment. We upcycle mispurchases and other unwearable pieces or fabrics, whether tattered or threadbare, poorly cut or just plain dated, like those frumpy outfits in your closet and still frumpier ones in the cellar. A hand-me-down or a piece you bought years ago is important to you because of the memories it brings back? Or you’ve bought a nice vintage piece but it’s not actually wearable? 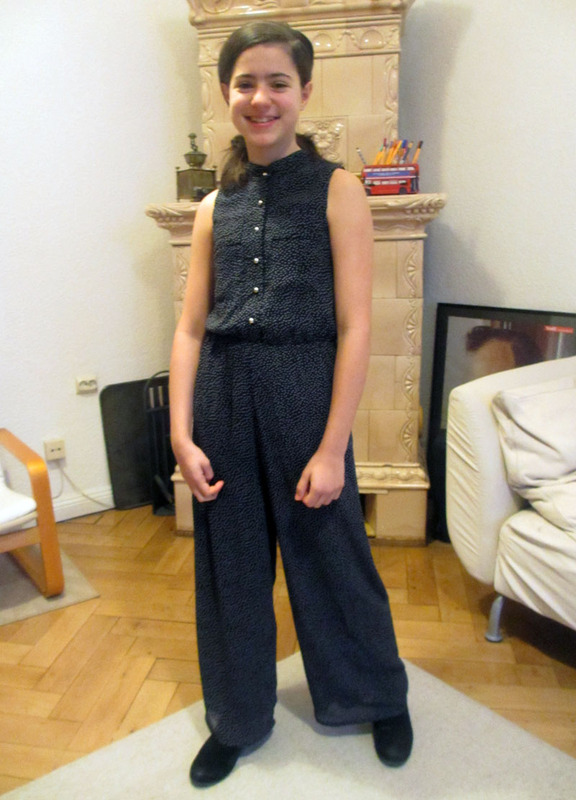 My daughter in her secondhand, one-piece pantsuit from Brighton, recently hemmed by Bis es mir leibe faellt. If such garments can’t be restored or no longer work from today’s perspective, why not try modernizing them? We’ll redesign them, combine them with other pieces of clothing or materials, and transform them with your assistance into something new. I discovered the shop when my daughter returned from England with a pantsuit that she loved, but the pant legs were too long for her. I could have hemmed them by hand but I knew it would look better if done by a tailor. Searching online for a local schneiderei shop, this website came up, and I realized this gorgeous store that I’d been walking past in our neighborhood is, at heart, a tailor. While my daughter tried on her pantsuit so the young woman in a black beret could pin up the pant legs, I went through their two small racks of hand-made clothes and fell in love with a shirt made from men’s socks. Go figure. Display featuring Parsnip soup with apple and ginger. Every last ingredient needed is on the table, packaged for one serving. Priced at 2,90 euros per person. Each of the 20-odd tables at the Kochhaus is devoted to a single recipe — there are three starters, two salads, one soup, four pasta or vegetable dishes, three fish and four meat main courses, and three desserts. 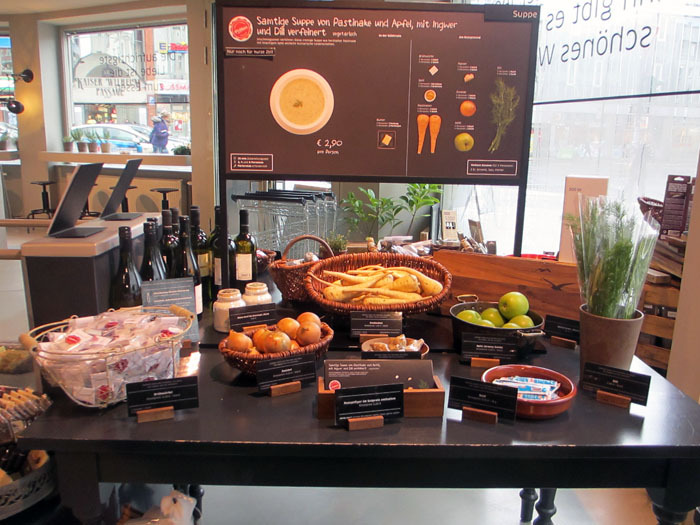 Each table and its adjacent cooler provide everything needed to make a specific dish, and an artfully designed poster mounted on each table shows photographs of ingredients and the finished product. A folded recipe, a kind of illustrated storyboard for cooking, comes with the ingredients. A scenario. A customer comes into the Kochhaus in the evening after a hard day at work. He is tired of take-out and restaurants. He wants to use his own kitchen. He considers the dishes proposed by the posters, chooses one he has never made before — say, tom kha gai, a Thai coconut soup with chicken and lemongrass — chooses the ingredients for two servings and checks out. At home, preparation is swift, the result is delicious, and there are no leftovers. A couple of times now M and I have gone in just to get inspired. Since we’re the kind of people who do have odds and ends in our fridge, we didn’t buy every last ingredient to make our rigatoni with spinach and goat cheese, but we did buy their small container of sundried tomatoes and large package of fresh spinach. They also happen to have a coffee bar and amazing baguettes. We’ll be back, if only to graze for ideas. Half coffee shop; half weekly-changing discount goods. In a word: random. Yet brilliant. This place has been around a lot longer than the ones I mention above and is far more of an international conglomerate than the others, but it remains so German and so locally beloved that I just have to mention it. No, it’s a basics store! One green jacket, anyone? Would you buy contact lenses from a coffee shop? How about a new car? Perhaps some insurance products with your drink? If you live in North America, these questions probably sound absurd. But it’s the business model of Tchibo—a firm which describes itself in utter seriousness as “Coffee shops also selling housewares, accessories, and clothes.” In practice, this model is even more confusing than it sounds, because—as the official corporate slogan puts it—Tchibo is “A New Experience Every Week.” So, as of June 18th, they’re selling household furniture; a few months ago, it was American country-western clothing. Next month, who knows? Tchibo is the place to go for unpretentious cup of coffee, as well as utilitarian rain pants for your bike commute. Or so I heard, a little too late. Tchibo had them for sale briefly last fall, and I missed out. You have to stay on top of their offerings; nothing lasts more than a week. Tchibo thrives on people’s desire for a good deal; they keep you coming back to see what they have now. Friends as well as online reviews report that the quality of the few items they offer is quite good, and their items are always reasonably priced. But I still can’t get over the random factor: household goods like a single iron, one style of long sleeved dress, men’s basic pajamas, scrapbooking materials, and a garlic press, might be offered. The randomness is accentuated when you turn around and realize half the store is basically a Starbucks. Could any of these places be a hit in the US? My bet is on KochHaus, but I really wish some of my very talented sewing friends would launch a Till it’s in Tatters in the Twin Cities. I think we’ve got the cheap goods market pretty well covered by Target, and besides, I like knowing their goods will still be there next week. This entry was posted in City life and tagged Bis es mir leibe faellt, Kochhaus, random, retail, Tchibo, upcycling on March 7, 2014 by Jill M..
Creative! Your guess was mine too. I vote for Kochaus, too. Great idea. Tell me you bought the sock shirt! Please! Oh! Haven’t done it just yet. It’s a bit of a splurge.